The first school in this area (at one time in the RM of Assiniboia and today part of Winnipeg) was Sturgeon Creek School No. 30, whose district was established in January 1876. In 1904, a two-storey wood frame schoolhouse, measuring 20 by 30 feet, was constructed on Lot 114 in the Parish of St. Charles, at 3085 Portage Avenue. It had four classrooms for classes in grades 1 to 9, and the structure featured oiled wood floors and a wood-fired furnace. The second floor was expanded in 1906 and the basement was enlarged in 1907 on a design by architect Frank R. Evans. By 1949, the 45-year-old building was showing its age, notably creaking and shaking when buffeted by strong winds. Filled to its 150-pupil capacity, an additional 80 students attended classes in the Sturgeon Creek Municipal Hall across the road. In June 1949, Principal Frances Ateah invited in newspaper reporters to show them its unsafe condition. Outraged local parents demanded that the building be replaced. 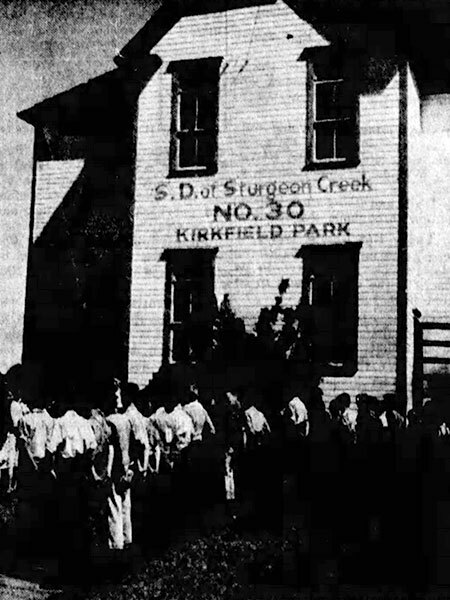 Construction of what became known as Kirkfield Park School #1, at 3195 Portage Avenue, began in 1949 but was delayed by the onset of the 1950 Winnipeg flood and labour action. The four-classroom wood frame and stucco structure was built by Building Mechanics Limited at a cost of $49,850 and was completed around mid-September 1950. Built in 1953 just west of School #1, at the corner of School Road and Portage Avenue, the cornerstone of Kirkfield Park School #2 was laid on 21 September 1953. Attending the ceremony were School Inspector H. R. Brown, architects Walter Katelnikoff and Dennis H. Carter (of the firm Smith, Carter, Katelnikoff), School Board Chairman Mr. F. Benjaminson, trustees Mrs. H. McBride, Mr. V. Harbottle, and Mr. M. Schneider, Principal Joseph Antonin “Tony” Duhamel, Secretary-Treasurer Mrs. R. A. Sansome, and M. Solonyka of Semmier Construction Company. On 23 November 1953, it was officially opened by W. C. Miller. The eight-classroom facility cost about $83,000 to build and initially hosted around 260 pupils. A four-classroom addition was built in 1955 at a cost of $36,000. Grades 1 and 2 were held in School #1 while grades 3 to 11 were in School #2. During the fall of 1963, construction began on a gymnasium, a new heating plant for Schools #1 and #2, and other renovations, completed at a cost of $144,425. Following a Department of Education decision to make local school boards responsible for the education of students with disabilities, the facility was converted into an educational centre for such students. It replaced a previous facility at the Kinsmen School, which then realigned to focus on pre-school ages. Operational costs were split between the Assiniboine North School Division and the St. James School Division. After a few renovations, the facility opened in September 1967 with six classrooms and 57 students. The former students of Schools #1 and #2 were accommodated temporarily at Heritage School or Lincoln School while Arthur Oliver School was being constructed and they went there starting in 1968. The school was closed in 1990 and its students were accommodated in other area schools. The building and property was put up for sale in 1993 and the building was demolished. The site is presently occupied by a supermarket and its parking lot. Source: Winnipeg Tribune, 15 June 1949, page 1. “Notice,” Manitoba Free Press, 28 November 1905, page 2. “Tenders,” Manitoba Free Press, 30 May 1906, page 2. “Tenders,” Manitoba Free Press, 5 August 1907, page 2. “Local notes,” Manitoba Free Press, 14 October 1911, page 34. “Personal and social,” Manitoba Free Press, 17 July 1917, page 3. “Social and personal,” Manitoba Free Press, 15 September 1930, page 8. “School ‘fire death trap,’ claims suburb principal,” Winnipeg Tribune, 15 June 1949, page 1. “Suburban school,” Winnipeg Tribune, 15 June 1949, page 2. “Trustees lack cash to build school,” Winnipeg Tribune, 16 June 1949, page 17. “Tenders,” Winnipeg Free Press, 31 March 1950, page 25. “Sturgeon Creek School construction progress,” Winnipeg Free Press, 26 July 1950, page 3. “Flood and strike,” Winnipeg Free Press, 1 September 1950, page 3. “Heavy construction program is planned,” Winnipeg Free Press, 4 March 1953, page 3. “Sturgeon Creek School vote Friday,” Winnipeg Free Press, 1 June 1953, page 3. [Photo caption], Winnipeg Free Press, 22 September 1953, page 11. “Miller to open Kirkfield Park School,” Winnipeg Free Press, 19 November 1953, page 3. “Sturgeon Creek,” Winnipeg Free Press, 27 August 1955, page 3. “The Kirkfield Park School District No. 30” Winnipeg Free Press, 29 May 1964, page 14. “Assiniboia school construction starts,” Winnipeg Free Press, 3 June 1967, page 28. “Taking the initial step to happiness,” Winnipeg Free Press, 23 September 1967, page 6. Obituary [Stefan Bjorgvin Stefansson (1889-1971)], Winnipeg Free Press, 30 March 1971, page 36. “Two schools to close,” Winnipeg Free Press Weekly West Edition, 3 June 1990, page 3. “Board credits closings for keeping levies down,” Winnipeg Free Press, 5 May 1993, page B3. “School buildings for sale,” Winnipeg Free Press, 3 November 1993, page B20. Manitoba School Records Collection (GR9926), Sturgeon Creek / Kirkfield Park School District No. 30 Daily Attendance Registers, Archives of Manitoba. Kirkfield Park School History, 1904-1974, St. James Assiniboia School Division, circa 1974. We thank the St. James Assiniboia School Division, Mari-Jean Nachtigall, and Robert Harbottle for providing additional information used here.